If you are looking for information on the Kwik Kerb franchise business opportunity, Kwik Kerb franchises or Kwik Kerb franchising, then you have come to the right place. Many people go to work for someone else every day of their lives. Others march to the beat of a different drum. Are you ready to join the "band" of workers turned successful business owners? Can you see yourself on vacation at Club Med, relaxing on the beach or enjoying your children's school or sporting events? Kwik Kerb gives you the power to increase your income and enough free time to enjoy it! We have created an opportunity to determine your own lifestyle and to become our next great success story. Choose to be the Master of Your Destiny! Demand for continuous freeform concrete landscape edging, continues to grow exponentially in the United States. The many unique features of the Kwik Kerb total business system built around the Edgemaster curbing machine sets industry standards, dove-tailing practical engineering with profitability. The EDGEMASTER is the cornerstone of the Kwik Kerb turn-key business system. A truly LOW RISK investment, with high immediate profits is the winning formula with this proven business system. The KWIK KERB BUSINESS can be operated by just one person, and can produce highly profitable continuous concrete edging at a rapid rate. Some curbing contractors have reported profits exceeding $10,000 in ten days! The total business system comes with the Edgemaster curbing machine, a ground prep machine, a variety of shaped profiles, all the accessories and tools required to create decorative edging ranging from basic concrete to highly attractive and durable custom color finishes, along with marketing supplies and continual training and support. On top of that, Kwik Kerb continually comes out with new and innovative products such as EuroStyle and EuroBrick decorative concrete curbing. Kwik Kerb is simply the best way to enter the concrete curbing business. see the potential for Kwik Kerb! 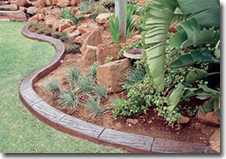 Commercial and residential applications for continuous concrete landscape edging and borders abound. Some examples are golf cart paths, parking lot curbing and tire stops, pool decks, residential and commercial landscape beds, and other areas where low maintenance landscaping is needed. Market demand is high because continuous concrete landscape edging reduces weeding and maintenance, controls erosion, and is a significant contributor to increased property values and attractiveness. High profits and a low investment price make Kwik Kerb an easy choice with contractors wanting to expand their current business and for entrepreneurs new to the industry. Or do you get paid on someone else's set pay scale? ...Do you want to earn more money? With Kwik Kerb, you pay yourself, sometimes as much in a day as you would earn in a job in a week! Traditional business overheads - electricity, rent, wages, and equipment maintenance - are not necessarily part of a Kwik Kerb business. You can choose any reasonable vehicle to tow your equipment trailer, and raw material costs are very low. Profit margins by comparison, are high as this graphical example shows. These factors, combined with low debt risk, mean you can earn substantial cash income from your first weeks of work, enabling you to aim at recovering your investment in a very short time. Many Kwik Kerb businesses recover their initial investment in less than a year. You could choose this as your first year's goal! "Kwik Kerb being around our house has really improved the look and that's the bottom line that we wanted. 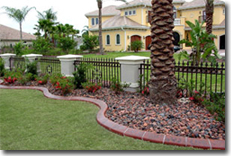 We chose Kwik Kerb because we felt that they had the best product and the service was great."